25 year old Hope Olusegun, and seven of his mates were arrested in December 2012 at the 1004 Housing Estate by the Economic and Financial Crimes Commission over allegations of fraud and internet scam. The 'Yahoo Boys' who have been operating for quite a while lived a lavish lifestyle, bought the most expensive cars and showed off at every opportunity they got. One of the undergraduates, Hope Olusegun (pictured above) an indigene of Okene, Kogi State, had a Mercedes Benz SUV, and a 4Matic Mercedes Benz car and before he was arrested, he bought a Toyota Camry for his one year old son. Yes, that's what they did with other people's money. Fortunately some residents at the estate alerted the EFCC about their activities. “One of the undergraduates, Hope Olusegun, a 25 year-old from Okene in Kogi State, and claims to be a student of Computer Science at the Kuala Lumpur Metropolitan University, Malaysia. 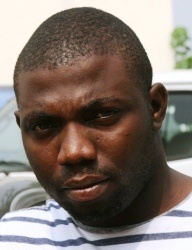 He was arrested by operatives of EFCC over allegations of fraud and internet scam. A search conducted by EFCC operatives at Olusegun’ s apartment led to the recovery of several items such as laptops, iPad phones, traveling documents, cheque books, flash drives, internet modem, and three exotic cars – a Mercedes Benz Jeep, One 4Matic Mercedes Benz Car and a Range Rover Sport SUV. When asked how he came about the cars, Olusegun said the cars belonged to his sister who he claimed lives in the United Kingdom. Operatives of the EFCC also downloaded over 80 implicating documents from the laptops recovered from Olusegun. However, the Commission is making effort to track down other members of Olusegun’s syndicate who are currently at large. Tunde Wasiu Sodiq, another undergraduate and member of another syndicate with close affinity to Olusegun’s gang was also nabbed by operatives of the EFCC at the Housing Estate. Besides Sodiq, six other members of the syndicate were equally arrested. They are Badmus Akeem O, Ajijola Oluwatosin Emmanuel, Adebesin Olalekan, Raji Resaq O, Ajibola Adeniyi and Adeboye Lamidi. Their arrest was sequel to a petition on their notorious activities at the Housing Estate. Sodiq (23) hails from Lagos and claimed to be an undergraduate of Brandry University, Malaysia . Tunde Sodiq claimed the Range Rover Sport car which was recovered from them belonged to his mother but the personalized number plate bears his nickname – “T.Wizzle”. In his statement, he claimed his mother “decided to customize the car plate number after the name of her first son." The suspects will be arraigned in court soon.